Typically we reserve our tech blog space for new, innovative products in the industrial automation space, or a quick how to guide for those complicated PLC integration or VFD start up applications. Today we are bringing it back to the basics with one of our favorite electrical representatives, Bob Powell from ElectroRep. Bob's going to talk about strut. That's right – one of the bread and butter electrical supply products that are used to support everything from wire to lighting fixtures to transformers. We hope you are equally impressed by the time and cost savings this new product will bring to the market. With over a decade of experience working in the electrical industry, strut is one of those products categories where I have seen minimal product innovations throughout my career. However, B-Line by Eaton has come up with a game changer with their 4Dimensional Channel. Yes, I know, strut is bent metal used to hang and support electrical equipment. What's the big deal? Well, B-Line's 4D strut can reduce material cost up to 50% and in some applications reduce installation time by 75%. That’s why B-Line’s 4Dimension Channel System is a true game changer. Watch the 4Dimension Overview Video for a summary of the products capabilities and applications. What is B-Line’s 4Dimension Channel? In a nutshell, 4D Channel is strut with 4 sided capability, meaning equipment and material can be mounted on the top, bottom, left or right of the strut. Eat your hearts out Mechanical Designers, the 4 sided capability allows for some incredibly sophisticated racking systems. 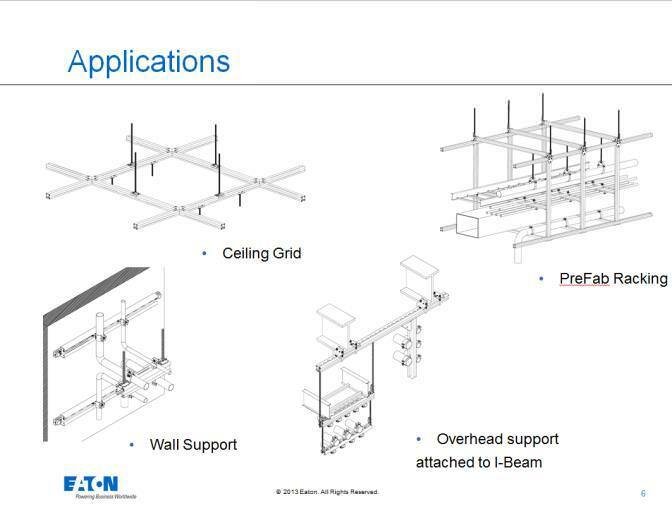 Check out the Ceiling Grid, PreFab Racking, Wall Support and Overhead Support sample applications in Figure 1. Not only will you find extraordinary flexibility in your design, B-Line’s 4Dimensional Channel is also 10% lighter and 10% stronger. 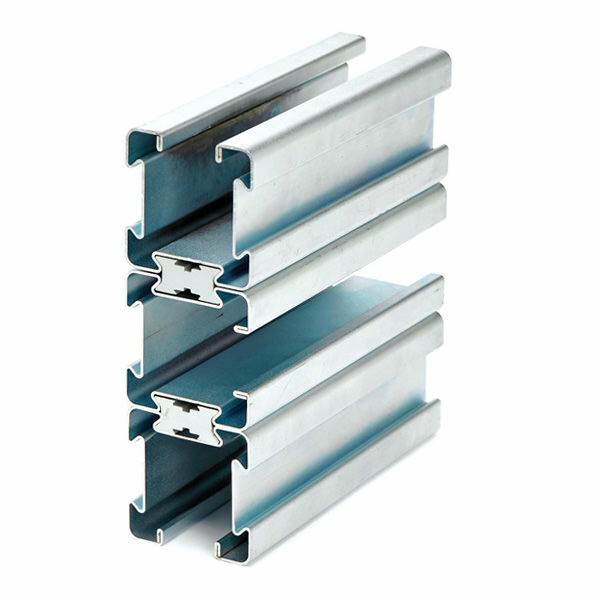 In many designs, the 4Dimensional Channel replaces back to back strut applications. When the mechanical load requires a back to back design, the 4Dimensional Channel can be field modified to a back to back design to meet the necessary load requirements. How is B-Line’s 4Dimension Channel a true game changer? Throughout the development of this new product, I worked closely with BLine’s design team to help them gather feedback via the voice of the customer. In the preliminary design stage we knew that the 4 sided capability would open up new design possibilities and provide an excellent substitute for back to back strut in most applications. However, in order for the 4Dimension Channel to be the “go to” strut for both the standard and back to back applications we knew that we needed something more. Working closely with our customers, particularly contractors, we figured it out. FITTINGS AND ACCESSORIES!! Pretty simple, huh? While the new 4Dimensional Channel is compatible with 90% of our existing fittings, the 13 new fitting designs drastically reduce installation time. On the jobsite, the contractor’s pain point came from the installation time of traditional strut. With BLine’s new, innovative fitting designs some applications, specifically trapeze applications, installation time was reduced drastically. For example, check out B-Line’s Flip Clip. In a traditional trapeze installation the first hex nut would be threaded into position, then the wedge washer, then the traditional strut and another wedge washer. The Flip Clip installation requires the first hex nut to be threaded into position and then the Flip Clip self-locks into the strut. This 4Dimensional Channel Video does a great job of comparing the traditional and new installation process. 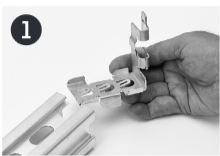 The Flip Clip decreases installation time up to 30% and reduces assembly materials by 50%. The Flip Clip provides these advantages without compromising the strut system’s load capacity. The Turn and Lock solution is my favorite. It is so simple. 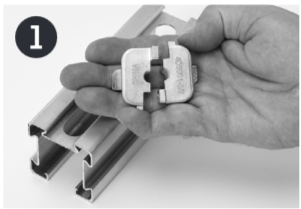 The Turn and Lock completely eliminates the need for a lock nut or hex nut, which saves up to 50% on installation time and assembly materials when compared to traditional strut trapeze installation methods. To install the Turn and Lock, simply place the Turn and Lock fitting into the left and right sides of the 4Dimensional Channel, position the trapeze into the desired location on the hanging rod, and then rotate the Turn and Lock one half turn to lock the trapeze into place. I told you it was easy. Check out the video - installation time is less than a minute. To learn more about 4Dimensional Channel visit B-Line’s Product Resource Page. Here you will find the 4Dimension Catalog, Overview Brochure, Engineering Information, Instruction Sheets and Product Demonstration Videos. Buckles-Smith Electric is currently stocking the 4Dimensional Channel, fittings and accessories. Contact Buckles-Smith for pricing and availability on 4D Channel Strut today. With over 15 years of experience in the electrical industry, Bob is a great resource for learning more about the best electrical products available to our customers. Headquartered in Saulsalito, CA, ElectroRep represents companies in the electrical industry by consistently providing quality products and services which meet or exceed our customers’ expectations. You've got questions, we've got solutions. With ten application engineers on staff, Buckles-Smith's Tech Blog features the latest news on industry technology and commentary from our resident experts. We hope this Blog will help you solve most, if not all, of your technical problems.